Session pianist Leon Huff played on sessions for Phil Spector, the Ronettes, and Carole King in New York City before moving to Philadelphia. He formed the Locomotions, and did sessions for Cameo and Swan. Huff performed on the song “The 81,” which was co-written by Kenny Gamble, who was at the session seeing the tune being recorded by Candy & the Kisses. Huff earned his first hit as a composer writing “Mixed-Up Shook-Up Girl” for Patty & the Emblems in 1964. He joined the Romeos the next year, then teamed with Gamble to form Gamble Records. 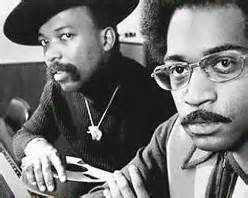 They subsequently co-wrote and co-produced songs for the Soul Survivors, the O’Jays, and others before forming Philadelphia International Records in the early ’70s. Their use of strings, the sophisticated yet soulful sound, and careful mix of socially conscious and romantic tunes provided hits for the O’Jays, Harold Melvin & the Blue Notes, Teddy Pendergrass, MFSB, the Intruders, and others. Huff also wrote hits on his own for the Ebonys, People’s Choice, Carolyn Crawford, and Bunny Sigler. He issued two singles as a solo artist on Philadelphia International in 1980 and 1981, with “I Ain’t Jivin’, I’m Jammin”. Gamble and Huff have, both separately and together, written and produced over 170 gold and platinum records and were pioneers of Philadelphia soul and the in-house creative team for the Philadelphia International record label. On March 10, 2008 the team was inducted into The Rock and Roll Hall of Fame in the non-performer category.